The Altistart 22 soft starter is compliant with pollution Degree 2 as defined in NEMA ICS1-1 or IEC 60664-1. For environment pollution degree 3, install the Altistart 22 soft starter inside a cabinet type 12 or IP54. ATS22 soft starters are open devices and must be mounted in a suitable enclosure. Leave sufficient free space to help the air required for cooling purposes to circulate from the bottom to the top of the unit. 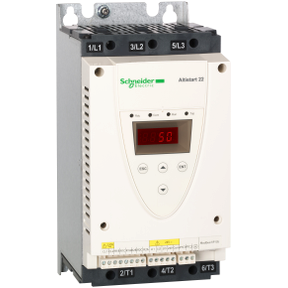 Mount the Altistart 22 Soft Starter within ± 10° of vertical. Do not locate the Altistart 22 Soft Starter near heat radiating elements. Electrical current through the Altistart 22 Soft Starter will result in heat losses that must be dissipated into the ambient air immediately surrounding the soft starter. To help prevent a thermal fault, provide sufficient enclosure cooling and/or ventilation to limit the ambient temperature around the soft starter. If several soft starters are installed in a control panel, arrange them in a row. Do not stack soft starters. Heat generated from the bottom soft starter can adversely affect the ambient temperature around the top soft starter. To help proper air circulation in the soft starter, grilles and forced ventilation can be installed. ATS22 soft starters connected to motors with the delta connections can be inserted in series in the motor windings. The following wiring requieres particular attention. It is documented in the Altistart 22 Soft start - soft stop unit user manual. Please contact Schneider Electric commercial organisation for further informations. A 400 V - 110 kW motor with a line current of 195 A (nominal current for the delta connection). The current in each winding is equal to 195/1.5 or 130 A. The rating is determined by selecting the soft starter with a permanent nominal current (ICL) just above this current.